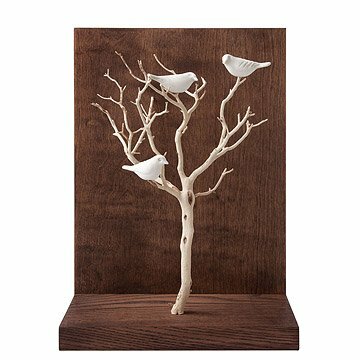 This sculptural scene features porcelain birds perched on a natural tree branch. Chris Stiles' three-dimensional composition of manzanita branches and porcelain birds captures the rustic charm and tranquility of a natural forest vignette. Stiles selects bonsai-like branches for their individually distinctive, shape and size, then adds three expressively hand-sculpted birds to animate the scene. The contrasting backdrop of stained hardwood plywood on a solid hardwood shelf includes a mounting bracket for a convenient, flush wall mount. The design of this diorama-like piece produces sympathetic shadows and a natural depth of field for a compelling sculptural experience. Handmade in California. Chris Stiles’s inspirations are usually found in nature near his Los Angeles home. He absorbs the lines, colors and patterns he finds and translates them into beautifully crafted sculptures. His passion for the outdoors helps him discover the basic threads of life, not just in a bird or a bone, but in everything he encounters. "California is so diverse with its landscapes, ethnicities and West Coast culture … it’s a true melting pot for creativity,” Chris says. It’s what he calls “the touchstone of my creativity." From start to finish, Chris highlights the simplicities he finds in nature to produce organic sculptures. His goal is, as always, to connect us not just to an image or an object, but to another familiar, earth-bound material—ourselves. 10" L x 5.5" W x 14" H; 6 lbs. Due to the handmade nature of this item, some variance is to be expected. Care: dust lightly taking special care not to disturb branches.